As much fun as cooking Thanksgiving is, the frugal side of me enjoys finding the best ways to use up the leftovers. Here are the three standards which are now expected with as much anticipation as T-Day extravaganza. 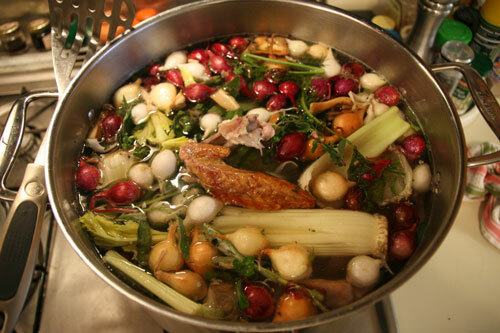 First there is the turkey–which means turkey stock! It’s also a great way to use up the left over vegetables. Like these pearl onions that I couldn’t deal with peeling them all. And the extra celery. And left over turkey was changed into this lovely turkey salad from a chicken salad recipe from the Barefoot Contessa. That tarragon makes it! For some reason, we always have a lot of mash potatoes left over. I could do a shepard’s pie, but instead I opt for potato bread. Oh, it’s so good with that turkey salad! And lastly the leftover half and half is transformed with the help of Trader Joe’s holiday Jo-Jo’s into ice cream. A tradition started last year which will be continued for hopefully many years to come. Congratulations! Your house is too too cute! It is perfection! I’m so happy for you both! The moving when super pregnant part; not so fun but a new house for baby, how exciting! My baby kitty james would to request the Jo Jo ice cream for when we come visit. I LOVE YOU! James would like to post some recipes of his own- would that be ok? We love you!